The derelict Astoria cinema in Brighton is to be demolished and replaced by energy-efficient offices. The Grade II listed building has been empty for 15 years despite a number of ideas to bring it back into use. Members of Brighton and Hove City Council Planning Committee have voted to allow a new building up to six storeys high on the site in Gloucester Place, near St Peter’s Church. It will include a dozen starter units aimed mainly at people in the creative industries or small digital media or IT companies. The building will also house a café and a community meeting room. Councillors voted for the plans after being told that the building – last used as a bingo hall – was genuinely redundant and that no viable scheme could be found to restore it. 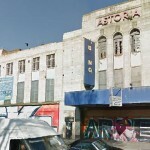 A report to councillors said that no organisation had been able to come up with realistic plans to renovate the Astoria, a project estimated to cost at least £3.5 million. The art deco cinema was built in 1933 and included a magnificent auditorium with impressive décor. For many years it has been a sorry sight, with percussion group Stomp buying it at one stage but unable to make a go of it. Businessman and property developer Mike Holland bought it four years ago for more than £2 million. Despite his track record of preserving threatened historic buildings, such as Stanmer House in Brighton and the Engineerium in Hove, he has applied to demolish the Astoria. Sir Terence Conran’s architectural practice has come up with the energy-efficient proposal that won over councillors. The design is intended to maximise the use of passive solar heating and natural ventilation through a chimney effect. Rain and waste water from hand basins will be used to flush the toilets. Planning committee chairman Councillor Phelim MacCafferty said: “The council took this unusual decision on this occasion because of the special circumstances. “The planning committee was convinced by those circumstances that proposals for the reuse of the Astoria as it stands were exhausted. The scheme’s backers believe that it could create up to 200 jobs. Brighton and Hove Economic Partnership’s executive director Tony Mernagh said: “This decision shows that Brighton and Hove means business, providing grade A employment space for grade A jobs for our growing, young population in a sustainable building in a sustainable location. I went to see Jaws there in 1975 with my dad when I was a nipper! Cllr MacCafferty should have saved this building not knocked it down. What a shame to see our heritage needlessly destroyed by the Greens. Aaa you really must stop posting sad party politicking bumkum. It make you look puny. Does your first name start with ‘P’? This was a committee decision made by conservatives, labour and green councillors and not by Cllr MacCafferty alone. 3 cllrs did not support demolition & redevelopment – Green Cllr Hawtree, Labour Cllr Farrow and one other I can’t recall. I suppose I’m being puny now, but isn’t this building owned and being redeveloped by Mike Holland, local Tory wire-puller? It’s a pity it has to go. I would have thought central Brighton could support another cinema or venue. Then again, the Hippodrome is mouldering away, as far as I know – perhaps the effort needs to go into finding a sustainable future for that? I’m surprised they didn’t use the isnnearicgly common tactic for businesses these days whereby they:1) Build what they want.2) Get caught and served with enforcement notice(s)3) Apply for retrospective planning permission at the last minute.4) Appeal, again at the last minute after the application is rejected.5) Reach a compromise which would never have been accepted had they applied properly before construction/installation.The whole process takes about two years. Abuse of the planning system is nothing new. Sometimes the wheels turn so slowly they may as well fall off! Nooooooo!, save this old building!, surely we understand the importance of preserving such sites by now?